Fig. 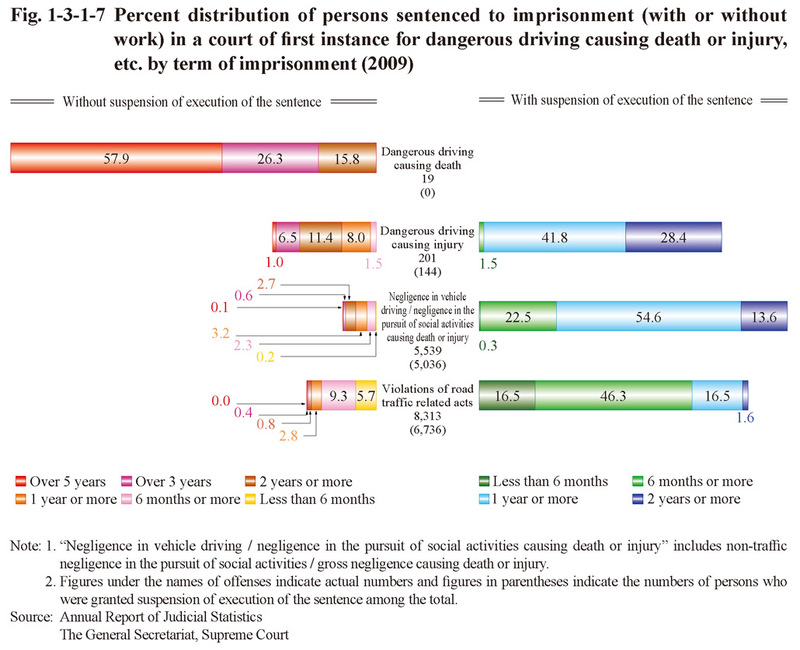 1-3-1-7 shows the percent distribution by term of imprisonment of persons sentenced to imprisonment with or without work in a court of first instance in 2009 for dangerous driving causing death or injury, negligence in vehicle driving / negligence in the pursuit of social activities causing death or injury, and violations of road traffic related acts. For dangerous driving causing death, all (19) persons were sentenced to imprisonment without suspension of execution of the sentence, with the proportion of those sentenced to imprisonment for over five years being high at 57.9%. For dangerous driving causing injury, the proportion of persons sentenced to imprisonment without suspension of execution of the sentence was 28.4% (57 persons) (that of those sentenced to imprisonment without suspension of execution of the sentence for over five years was 1.0%). 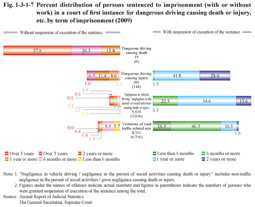 In contrast to that the proportion of persons sentenced to imprisonment without suspension of execution of the sentence for negligence in vehicle driving / negligence in the pursuit of social activities causing death or injury was 9.1% while that for violations of road traffic related acts 19.0%. The number of persons sentenced to fine in 2009 for negligence in vehicle driving / negligence in the pursuit of social activities causing death or injury (including those sentenced to fine in a court of first instance for causing death or injury through negligence) was 61,487 (of which the number of persons sentenced to fine in a court of first instance was 179) and that for violations of road traffic related acts 322,209 (302 (id.)) (Source: Annual Report of Judicial Statistics).